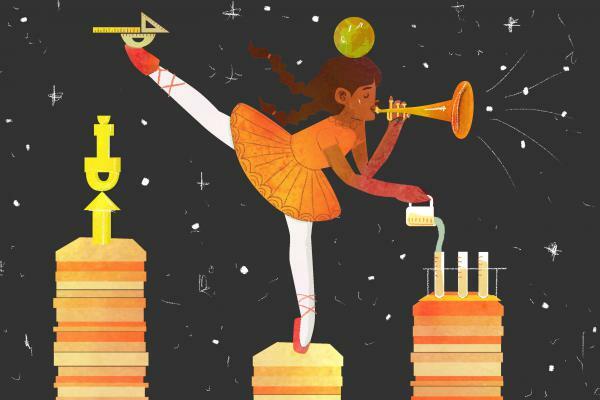 Over the past two decades, Robinson, an author, consultant and former education professor, has argued, among other things, that dance might be more important than math (though, he admits, both are important). And that our system of education is more like a fast food chain — robotic, formalized and industrial. In his new book, You, Your Child, and School: Navigate Your Way to the Best Education, Robinson takes his ideas about what a school should be and translates them into specific things parents can look for. Our conversation has been edited for length and clarity. It can be hard to connect these big ideas — like how schools should be more creative — to when you, as a parent, go on a school visit. What are a couple of the things parents should keep an eye out for when they are in a new school? One of the things to look at is the balance of the curriculum — which in shorthand is what it is we want kids to learn, and learn from. You want to make sure that there is a real balance and dynamism in the school curriculum. Testing tends to focus schools, for understandable reasons, on the areas on which they themselves are going to be judged politically. So there's been a narrowing of the curriculum in many areas. We've seen a reduction in things like arts programs, in recess, in practical vocational programs, because they're not subject to these tests. The emphasis on STEM — science technology engineering and math — they're very important. But the arts, the humanities, physical education, are just as important. So that's the first thing. I always encourage parents to take a look at the curriculum. And then the other is the physical environment of the school. Look at what's on the walls. Is there kids' work on the walls? Exhibitions? That also taps into the overall culture — you know, what sort of values are school promoting and how closely does it work with parents and the broader community? I think these are all reasonable criteria for the health and vitality of a school. When looking at a school culture, there are two themes that stick out in your talks and your books. 1: Not being afraid of mistakes. 2: Experimentation to find your passion, to play around and to try new things. Trial and error, making mistakes, not getting it, is a natural part of learning and living. And it's a great tragedy I think that the pressure of testing and certain teaching patterns makes children afraid to make mistakes. They become embarrassed if they, say, make a mistake in front of their classmates or if they get a lower grade. They think that they're stupid or dumb for having done it. And it can be something that lives with you for a long time. We're all of us a unique amalgam of our genetic inheritance and the experiences that we have along the way that our dispositions encourage us to have. And part of the role of parents is to understand and not be fearful of that diversity and to try and provide for it differently insofar as you can. And that's something I'm encouraging schools to do as well. It seems to be such an obvious thing to do, that human life is as diverse and as marked by variety as the natural world around us. And if we try to homogenize our kids by offering them a single measured form of education, inevitably we're going to marginalize the talents of most of them. The more you understand your own child, the more you can see what they need and then look for that in schools. That's really what it is. And for parents, there's nothing more important than their relationship with their children and vice versa. School is a major influence that can enhance it or come between them. And I think if parents can be better informed, encouraged, be given a sense of their options and choices, and also understand more about what their kids are going through — both in school and on the way to it and on the way back from it and be encouraged to think differently about that, then hopefully they'll be able to come to a clearer understanding of the best way of handling it and in the case of their own family. I read this book almost as a little bit of a love letter to public schools. Am I off there? I think that we should be defending our public schools. Public systems of education have been deeply influential and for many people liberating experiences. I owe everything I do to having gone through the public system of education in the U.K.
For the vast majority of kids — I mean the overwhelming majority of kids in Europe, the U.K., here — public education, as I say, isn't their best shot, it's their only shot. Many parents simply can't afford to go private and it's very unlikely anytime soon they would be able to. And there's no reason why a well-funded, well-supported, properly understood system of public education shouldn't meet all the needs that we have in mind. There's an assumption out there that somehow charter schools are inherently better or independent schools are inherently better than well-supported public schools and they're not. I mean there are plenty of really wonderful public schools and plenty of really rather dreary charter schools and uninspiring independent schools too. You know, there are better ways of encouraging, supporting and enabling a healthy system of public education than the ones we've had. All the money that gets spent on testing will be much better invested in the professional development of teachers. A lot of it would be much better invested in improving facilities at schools. A lot of it would be much better invested in creating partnerships with cultural and business organizations in local areas. Do you think we've seen the error of our ways? Do you feel that there is some peel-back on testing? I think yes, there are changes happening. One of the reasons that testing is being rolled back in some areas is partly because parents have organized and said that we've had this. And teachers, too. And that's also part of what I'm saying about schools, is that there is more room for change in the system than people realize. It isn't a question of lobbying Congress and not doing anything until they pass new legislation. There's an awful lot you can get on and be doing in the interstices of the current system. A lot of things that go on in schools are not a matter of a legal requirement, they're just habits that we fall into and they can be shifted. It's why there are so many good schools out there already doing it. As a parent, you have an interest, and you have a role, and you have some influence and power. And like all the influence and power you need to understand what is and to use it responsibly.